The sad fact is that single players are at a disadvantage on the PVP server due to the large numbers of players in groups who hunt down single players. I experienced it myself for months before I quit the server and almost quit the game. This is common knowledge among players. That's the point I'm trying to make. It became no longer enjoyable. The peace server is what saved this game for me. Im not against team play, don't get me wrong. And I probably know and understand history as least as well as you as it is my study and hobby these last 5 decades. So I understand that large actions do occur. I understand how wars are fought and lands captured. But you devs are really cutting into the fan base when you force people to join clans or die as you so indelicately put it. There should be a reasonable approach that allows both game styles to be played. Perhaps the two different servers are the answer. But I remember how fun the game was before the big patch in May 2017. And both single players and clans were playing together without being continually ganked. This patch is about port development. Please stop this fake news agenda of solo players cant do anything. Majority of battles on the OW are small engagements 2v2 3v3. Most battles in NA are small engagements. Even streamed battles - most of them are small engagements. Do not believe me - check past broadcasts of naval action on twitch. BUT. East India or West Indies was not conquered and developed by some solo guy. It was done by companies with their private fleets and armies like East India Company. Want to control West indies and build the best ships? Join the alliance with someone. Period. 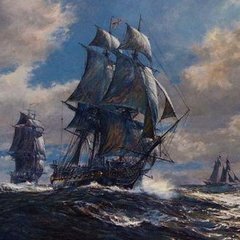 There is no historical or fictitious reference of solo privateers building great first rates. Sorry. You can in our game - but best ships will require lots of RVR and many players to participate. Please stop with these light rantings. We dont want them here. This game shines in solo combat AND fleet action, a lot of people come here to experience Trafalgar battles. Stop pushing your solo players are doomed agenda. Adding features to a group of players does not discard another group of players. 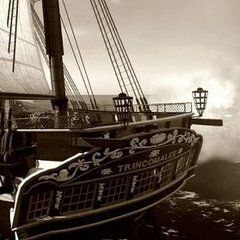 Solo players can capture amazing ships from clanned members for free + can group up into a small clans which can build a small holding somewhere or ally with large alliances who need experienced screeners or pvp trainers. Wars and lands were not won or captured solo in real life. This game tries to give you a realistic experience. Group sports are most popular sports. Football players do not demand solo content. Cherish it or accept that it is not for you - its fine to not like group based competitive sports or activites. Countries were created when you JOINED forces with others. I am sure Franklin (who created this ad) would never get anything solo. Clan Merge, clan merge everywhere! Not even close. Cargo missions are chump change. 250k / 30 members = 8333 per person. If we only had 30 ppl clans. How long it takes to make $8333?